The England captain reached the close unbeaten on 56 as the visitors reached 206 for five in response to the Notts first innings score of 408. Root has batted for 166 minutes and faced 110 deliveries, with eight boundaries. He was dropped on eight by Chris Nash in the slip cordon from the bowling of Paul Coughlin. The unlucky Coughlin then bravely attempted to dive full length to catch Root’s miscued pull in the deep off Stuart Broad. The battle for supremacy between Root and Broad lived up to the pre-match expectations, with honours just about shared between the number of play and misses and the assortment of crisp drives. 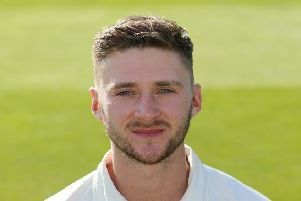 Whilst Broad couldn’t dislodge his international team-mate, he did remove Harry Brook, lbw to a full-pitched delivery for 30, and Tom Kohler-Cadmore, snared at deep backward square for 22. Luke Fletcher, back in action after missing much of the pre-season preparations whilst waiting for the birth of his new daughter, twice hit the bullseye in bowling both Gary Ballance and Jack Leaning; the latter out for a three-ball duck when not playing a shot. Fletcher also had a hand in the other wicket to fall, pouching a mistimed effort from Adam Lyth at mid off, from the bowling of Jake Ball. Lyth had looked in imperious form, stroking 13 boundaries in his 129-ball knock of 81. His partnership of 83 with Root has been the largest of the fixture to date. Earlier, Duanne Olivier collected his first five-wicket haul in Yorkshire colours as Nottinghamshire were dismissed for 408 on the second morning of the Specsavers County Championship match at Trent Bridge. Olivier, with two wickets on the first day, closed with figures of five for 96 from 28 overs. Having begun the session on 324 for five, Notts soon lost the vital wicket of their centurion. Joe Clarke, unbeaten on 109, added three more runs before losing his middle stump to a delivery from Olivier that nipped back. Tom Moores had reached 27 before driving the South African to cover and then Broad was pinned lbw second ball. Steve Patterson took the final two wickets of the innings, having Fletcher caught at slip and Coughlin held behind, as he picked up four for 78. Coughlin made 46, sharing in a last wicket stand of 33 with Ball who made 15 not out. Bad light forced the players from the field 10 overs early, leaving Yorkshire 202 runs adrift at the halfway stage of the contest.